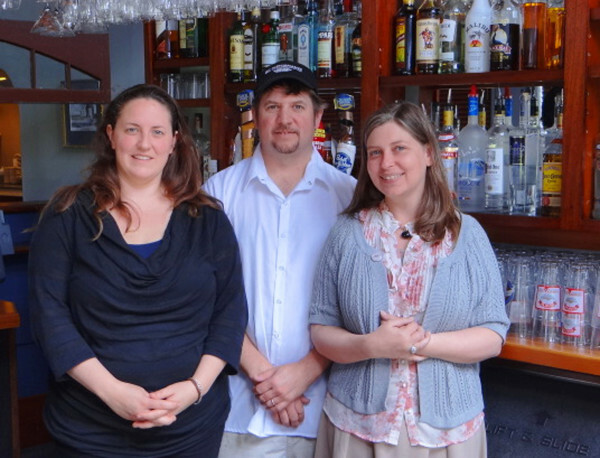 Nautilus Seafood & Grill owners pose by the Belfast eatery's bar in this May 2012 file photo: from left, Rosamond Peters, Ronald Mitchell Jr. and Jenifer Oakes. The restaurant will move to the Belfast waterfront. BELFAST, Maine — It’s been pretty quiet in the large building on the Belfast waterfront that was home to the Weathervane Seafood Restaurant until the eatery closed for the season in October 2014 and never reopened. But that’s all going to change soon, according to Jenifer Oakes of the Nautilus Seafood & Grill in Belfast. She and the other owners announced this week they will move to the Weathervane location this fall and open there in December. Nautilus opened on the city’s east side in 2012 and has won fans with such dishes as fried calamari with banana peppers, roast prime rib au jus, pan seared scallops and clam chowder. Oakes said she and partners Roz Peters and Ron Mitchell are looking forward to getting downtown, a move they think will be good for year-round business. The restaurant employs as many as 30 people in the busy summer season. The Weathervane, a Kittery-based New England chain, opened its Belfast location on the waterfront in 1985. In January, the company announced it would close four of its locations, including the restaurants in Brewer, Waterville and South Portland, because of economic conditions. Belfast, a seasonal location for the Weathervane, was not on the list. Nevertheless, it remained shuttered during the start of the 2015 summer season, which worried some in the city. She said news that the Nautilus restaurant will move downtown is welcome. Oakes said her restaurant will lease space in the waterfront building and that the Nautilus crew will spend the month of November renovating.